In the first two Gospels, there is a story of gentle irony at the expense of the non-discerning disciples. The Master had entered into a ship, to sail across the Sea of Galilee. The disciples had forgotten to take bread, neither had they in the ship with them more than one loaf. And the Master charged them, saying, Take heed, beware of the leaven of the Pharisees. And the disciples reasoned among themselves, saying, It is because we have no bread. One wonders which of them first saw the point of this delightful and yet pathetic incident; to whom do we owe its recording for posterity, to teach us not to be too literal minded? A like problem arises regarding the discourse of the Buddha with which we are concerned, and which also warns against the leaven of the Pharisees: against those who pay tithe of mint and anise and cumin, and omit the weightier matters of the law, judgment, mercy and faith; who love salutations in the marketplaces, and for a pretense make long prayers. In the story to be narrated, it is not certain to whose excellent memory and fine sense of humour we owe the record of the Buddha’s words. Tradition, in this matter wholly to be relied on, tells us that, at the first great Council of his disciples, shortly after his bodily death, the great disciples recalled and recorded his discourses, while on the beloved disciple Ananda was laid the duty of putting each discourse in its proper setting, restoring the circumstances under which it was delivered, with the names and characters of those who were present or took part in the conversation of which the Buddha’s teaching was a part. This choice of the beloved Ananda shows that his fellow disciples believed that he possessed a vivid pictorial memory, keen powers of observation, and a loving attention to his great Master’s doings, which would be certain to note and retain the image of the persons and events at each of the Master’s discourses; a shrewd insight into character also, and, we are justified by the records in adding, a lively and charming sense of humour. In the discourse with which we are concerned, it is not recorded that the beloved Ananda is present. The Buddha is depicted as going alone to visit a group of self-mortifying ascetics, who evidently filled a conspicuous place in the India of twenty-five centuries ago, as they do in the India of today; the most sensational of these self-tortures, lying on a bed of spikes, was evidently fashionable then, as it is now. But the fine character drawing and the keen humour of this story are exactly those that we find in others, of which Ananda may well have been the recorder, and we may conjecture either that the beloved disciple accompanied his Master or that the Buddha himself told the story on his return to his disciples, with Ananda as a delighted auditor. Thus the narrator finds a motive for his story, and incidentally draws an outline portrait of the householder Bond, who, as he tells us, forthwith set out for the park, to pay his visit to the pilgrim Banyan. Then follows one of those set passages, keenly observed and delightfully framed, whose stately repetition gives a peculiar charm to the Buddhist discourses. We are told that the self-mortifying pilgrims, gathered in the wide rest-house of the Queen’s park, were not, as we might expect, engaged in debate concerning righteousness and the law; but, instead, with a roaring, with a shrill and mighty noise, they were relating many kinds of common tales, such, for example, as talk of kings, talk of robbers, talk of ministers, talk of armies, talk of terror, talk of war, talk of food and drink and garments and couches, talk of garlands and perfumes, talk of kinships and cars, of villages and towns and countries, talk of women and men and heroes, talk of the street and of the village well, talk of the dead, all kinds of stories, traditions of the forming of lands and oceans, discussions of being and non-being. It is exactly like the mental medley of things wise and foolish that fill the columns of a modern newspaper, and the list recurs a little later, in identical terms, with the fine rhythmical effect of the orchestral enumeration in the story of the burning fiery furnace, in that compendium of magnificent stories, the Book of Daniel. Whether from shame, or merely through curiosity, the mendicant pilgrims consented to be silent. So the pilgrim Banyan warmed himself up with intemperate speech. And one may doubt whether in the whole cycle of Buddhist scriptures, there is a finer touch of humour than this. For this passage, like all these records, is to be recited aloud by devoted disciples, whose reverence for the Buddha knows no limits. Consider with what a twinkle of the heart they would describe their august Master walking in circles like a cow, and then consider the fine dramatic irony of the sequel. We are told that the pilgrims became silent; perhaps they cherished a delighted hope of seeing the Buddha walking in circles like a cow, or bowled over like an empty water-jar. “It is difficult, Banyan, for one of other views, for one of other practices, of other purposes, of other mental habits, for one following other teachers, to understand the discipline which I give to my adherents, the discipline through which my adherents are established in serenity, recognizing it as the firm foundation of their spiritual life. But come, Banyan, ask me a question concerning your own teaching of extreme self-mortification: in what conditions is this self-mortification perfected, and in what conditions is it not perfected?” The Buddha turned aside the question regarding his own teaching by saying that it was difficult to understand. Without doubt he realized that, while there was a spark of genuine spirituality in Banyan, the great mass of mendicant pilgrims with him were full of cavilling, stony ground on which no precious seed should be sown. But there was a still more definite reason, a rule framed by the Buddha himself, which he formulates in another discourse: “Whoever has been an adherent of another sect, and wishes to enter the discipline of this Law of Righteousness, desiring admission to the first degree, and afterwards to the second degree, must first remain on probation for four months, after which the disciples of strenuous heart will admit him to membership in the first degree, and afterwards to membership in the second degree of the Order of disciples. But even in such a case, the difference between individuals is taken into account.” It was not a favourable moment to explain this wise rule to Banyan; but, if his desire for light was genuine and strong, he would presently find it out. So, for the time, the Buddha parried the premature question, and introduced the whole subject of self-mortification, thus finding a motive for the special theme of this discourse. “Very good, Banyan. But let there be an ascetic who enters on a penitential exercise. He is not delighted with himself, nor is he full of self-satisfaction because of his penitential exercise. In so far as he is not delighted with himself nor full of self-satisfaction, in that measure is he purified. He exalts not himself, nor despises another. In that measure is he purified. He is not infatuated nor intoxicated. In that measure is he purified. Should he, because of his penitential exercise, receive gifts and honour and fame, he is not delighted with himself, nor filled with self-satisfaction because of this. In that measure is he purified. Nor does he on that account exalt himself and despise another. In that measure is he purified. Nor, should he receive gifts and honour and fame, is he thereby infatuated and intoxicated, falling into negligence. In that measure is he purified. Nor does he fall into making distinctions in foods, saying, ‘This commends itself to me; this does not commend itself to me.’ Nor, saying this, does he steadily reject that which does not commend itself to him, nor does he eat greedily that which commends itself to him, becoming infatuated with it, not recognizing the sin and danger in this gluttony. In that measure is he purified. Nor does he enter on a penitential exercise moved by a desire for gifts, honour and fame, with the thought that kings, courtiers, nobles, priests and householders will pay him honour. In that measure is he purified. Nor does he grow jealous of some ascetic or Brahman, saying, ‘That fellow lives lavishly; he eats every kind of food, grinding them all together with his thunderous jaws!’ In that measure is he purified. Nor, seeing some other ascetic or Brahman honoured, esteemed, highly regarded, respected among those whom he visits for alms, does he think, ‘People honour, esteem, regard and respect this fellow who lives lavishly; but they do no honour, esteem, regard, nor respect me, a true ascetic, living a life of austerity!’ Nor does he nourish ill-will and resentment against those who give alms. In that measure is he purified. Nor does he seat himself in some place where he will be seen of men, nor slink about among those who give alms, thinking to himself, ‘This is a part of my penance!’ Nor does he practise secretiveness, dissembling his views, and thus falling into deliberate lying. In that measure is he purified. Nor, when the Tathagata or an adherent of the Tathagata, teaching the Law of Righteousness, follows a method worthy of approval, does he reject it. In that measure is he purified. Nor does he nourish wrath or enmity, hypocrisy or deceit, avarice or envy, craft or guile; nor is he obstinate or conceited; nor does he entertain sinful wishes, falling under their sway; nor does he hold false views, becoming addicted to delusive opinions, nor grow worldly minded, grasping after riches and turning away from renunciation. In that measure is he purified. It is a wise question, showing something of the grace of humility. We shall on a future occasion consider the Buddha’s wise and gracious answer. In relating the story of the Buddha’s discourse concerning penitential self-mortification, its fruit and its danger, reference was made to a period in the West when like penitential practices were intensively followed, the period of the monastic communities and the great solitaries in the Egyptian desert. It may be worth while to show the likeness of these self-mortifying exercises in the Egypt of the fourth century of our era to those of the Ganges valley in the Buddha’s day, and in particular that the fruits and dangers were the same in these two sacred lands. In that forceful and detailed record of the Egyptian solitaries which is called The Paradise of the Fathers, the author records an experience which he personally noted. There was a certain man in Scete, he says, whose name was Stephana, who had dwelt in the desert for twenty-nine years; his apparel was made of palm leaves, and he lived in such a strict self-denial, and persisted to such a degree in ascetic abstinence, that he never had the least inclination for the meats which are usually desired, and which are pleasant to the taste; and he greatly condemned those who, because of sickness, either ate cooked food or drank cream. Now the gift of healing had been given to him to such a degree that he could cast out devils by a word. And it came to pass that on one occasion a man in whom was an unclean spirit came to Scete, and wished to be healed, and when the monk saw that he was sorely vexed by the devil he made a prayer and healed him. So much for the fruit of abstinence and self-discipline. But there was danger also. For, says the narrator, this monk was rejected by Divine Providence because of his immeasurable arrogance and haughtiness, for he imagined himself to be more excellent in his life and works than the other fathers. First of all, he separated himself from the brotherhood, and then he went and became archimandrite in one of the monasteries of Alexandria, “For,” he said in his pride, “am I to be in subjection to Macarius? Are not my life and works better than his?” And this man arrived at such a state of madness that he went to the city, and gave himself up to gluttony, and drunkenness, and to the eating of more flesh than rational beings are wont to eat, and finally he fell and settled down into the pit of unclean living. He gratified his unclean desires without shame, and became a laughing-stock to all who knew him. But he excused himself, saying, “The law was not made for the perfect.” The narrator goes on to say that strong efforts were made to redeem this man and bring him to repentance. But he remained arrogant and obdurate, and came to a miserable death. The Buddha spoke also of self-mortifying ascetics who sought praise of men and thereby forfeited the fruit of discipline. The same Macarius already mentioned is recorded as saying, “I hate the love of praise of young men who toil, and who lose their reward beause they expect the adulation of the children of men.” Then, we are told, another well-known ancient said to Macarius, “And it is not greatly acceptable unto me, but it is better that they should work for praise rather than that they should despise it, for it always constraineth those who love praise to lead lives of abstinence, and to keep vigil, and to live in nakedness for the sake of vainglory, and to bear afflictions for the sake of praise.” Then after these things the Grace of God came to them and spake, saying, “Wherefore do ye not toil for My sake? And why do ye toil for the sake of the children of men?” And they were convinced that they must not expect the praise of men but that of God. We shall see in what terms the Buddha brings out the same antithesis. It will be remembered that, in the discourse between the Master and the Brahman Banyan, the Brahman had expressed the conviction that self-mortification which is purged of all self-seeking and vanity has reached the summit, has penetrated to the inmost core. But the Master replied that self-mortification, even though it be thus purged, has only touched the outermost bark. Self-mortification, in the Buddha’s view, was not an end but a means. The problem to be considered now is, to what end is it a means? What is the true purpose of self-mortification? What corresponds in the Buddha’s teaching to “the praise of God”? The Master replied, “A self-mortifying ascetic, here in the world, is restrained by the restraint of the fourfold watch. In what way, Banyan, is a self-mortifying ascetic restrained by the restraint of the fourfold watch? First, Banyan, such an ascetic injures no life, causes no life to be injured, nor approves of the injuring of any life; second, he takes not what is not given, nor causes what is not given to be taken, nor approves of the taking of what is not given; third, he speaks not falsely, nor causes anything to be spoken falsely, nor approves of any false speech; fourth, he longs for no self-satisfaction, nor causes anyone to long for self-satisfaction, nor approves of any longing for self-satisfaction. In this way, Banyan, an ascetic is restrained by the restraint of the fourfold watch. When, Banyan, the ascetic is thus restrained, such an ascetic goes forward, he turns not back to lower things. He seeks out for himself a place of meditation, in the forest, at the root of some great tree, among the mountains, in a glen or a cavern in the mountains, or even in a place for the burning of bodies, or a dwelling in the woods, or simply a heap of straw in a clearing. Then, after he has gone forth to receive alms of rice in his bowl, and has eaten what has been freely given, returning to his retreat, he takes his seat in the position of meditation, holding his body upright, with heart and mind intent on recollection. Ridding himself of covetous desire for the things of the world, he dwells with heart free from covetous desire, he purifies his thoughts of covetous desire; ridding himself of the sin of malevolence, he dwells with heart free from malevolence, seeking the welfare of all living beings, he purifies his thoughts of malevolence; ridding himself of sloth and torpor, he dwells free from sloth and torpor, seeing the light, recollected, with consciousness alert, he purifies his mind of malevolence; ridding himself of vanity and fretfulness, he dwells not inflated by vanity, with heart inwardly serene, he purifies his thoughts of vanity and fretfulness; ridding himself of doubting, he dwells on the farther shore beyond doubt, no longer anxiously questioning concerning what is right and good, he purifies his thoughts of doubting. “Nay, not so, Banyan! Far from reaching the summit and penetrating to the inmost core, such self-mortification has but touched the skin, the outer bark.” That declaration is likely to astonish us as greatly as it astonished good Banyan. Is not the radiant love described the utmost possible fulfillment of the law of righteousness? Of what more can we conceive? We may anticipate the answer of the Buddha by asking a question: How is it possible for the aspirant, even after he has cleansed his heart of envy, anger, vacillation, sloth and unbelief, the “five obscurities,” even after he has torn out the root of egotism, even after he has made the complete sacrifice of worldliness symbolized by the alms bowl and the cave,—how is it possible for him to create this splendour of love in his clean heart? The answer is, that he has no need to create what is, as a potentiality, already there. 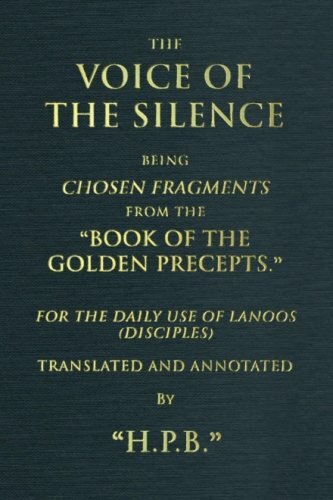 It is the treasure of gold buried in the field, to be brought to the light when the earth and stones are removed; it is the true desire of the heart, to be fully revealed when false desires have been purged away; it is the true Light which lighteth every man that cometh into the world, the Light of the Logos itself, the universal spiritual consciousness which underlies and gives life to every individual consciousness. But in the heart of unregenerate man that spiritual consciousness has been hidden and buried under a multitude of mental, passional and psychic obscurities, so that the Light can no longer shine through. With the removal of this accumulation of obscurities real life can begin. It is not too much to say that the whole system of self-denial, purification and asceticism imposed by the Buddha on his ardent disciples had no other aim than this: the removal of the heaped up obscurities which impede that Light. And this is true of every genuine religious teacher. The cleansing of the inner nature, mind and heart and soul, so that the Light may shine, is, therefore, not the end of the way, but its beginning; it is the entrance to the royal road. But, we may be inclined to ask with the ascetic Banyan, what can possibly remain to be undertaken or accomplished, after so much has been already done? The answer is really implicit in what has been said. The disciple, with fiery energy cleansing and purifying his inner life, has given access to the Light of the Logos. This, which would be otherwise altogether beyond his power, is possible for the simple reason that the Light is already there: is, indeed, the inner essence of his life. In the wise words of the Upanishad, he is That. But, if one may use such a term for the undivided All, he is as yet only a minute fragment of the Logos, only the end of one small ray. His tremendous destiny is, to enter into and become one with all of that infinite Life, or, to speak more truly, to realize that he has been one with that Life, through innumerable ages. Beginning with the dim, divine star that gleams in his cleansed heart, he is to grow and expand until he knows himself one with the infinite Light. So great, so limitless is the path before him. Therefore this is indeed not the end, but the beginning of the true, divine way. If the ardent disciple travel farther on that way, what should be the fruit of his journey? Let us for a moment consider. He is, step by step, to enter into the Logos; not as a part, but as the All. But the Logos is from eternity. Therefore, as he rises, the disciple will transcend Time, the great illusion which divides Being into a past which has disappeared, an evanescent present, a still imaginary future. The Logos is not omniscient, but omniscience, for the All, as consciousness, must be conscious of all things, whether in the heavens above, or on the earth beneath, or in the regions beneath the earth. And, since oneness of Being is the very essence of the Logos, he who enters into that divine consciousness, thereby enters into that perfect love which the Buddha has already described, a love abounding, magnanimous, compassionate. The ardent disciple, with heart and mind purified, is to enter into, and to share, that conquest of Time, that omniscience and love, which are, not so much properties of the Logos, as its essential being. So we come back to the dialogue between the Master and the ascetic Banyan. “Practising self-mortification, Banyan, the ascetic restrains himself by the restraint of the fourfold watch, and so goes forward, turning not back to lower things. Establishing for himself a quiet refuge for meditation, he irradiates the world with heart enkindled with love. Thereafter he calls to memory many a dwelling of his in by-gone times, that is to say, one former birth, or two births, or three births, or four births, or five births, or ten births, or twenty births, or thirty births, or forty births, or fifty births, or a hundred births, or a thousand births, or a hundred thousand births, many involutions of a world period, many evolutions of a world period, many involutions and evolutions of a world period, so as to say, ‘There I was of such a name, of such a family, of such a colour, with such a livelihood, experiencing certain joys and sorrows, completing such a span of life. Departing thence, I became manifest in such a place. There, I was of such a name, of such a family, of such a colour, with such a livelihood, experiencing certain joys and sorrows, completing such a life span. Departing thence, I became manifest here;’ thus he remembers many a dwelling of his in by-gone times, with all details and particulars. “Practising self-mortification, Banyan, the ascetic restrains himself by the restraint of the fourfold watch, and so goes forward, turning not back to lower things. Establishing for himself a quiet refuge for meditation, he irradiates the world with heart enkindled with love. Thereafter he calls to memory many a dwelling of his in by-gone times, one birth, two, three, up to a hundred thousand births, with all details and particulars. So with divine vision, pure, surpassing that of the sons of men, he sees beings departing and coming into manifestation, debased or excellent, fair or foul, righteous or evil; he sees these beings faring according to their works, so as to say, ‘These personages, of a truth, persisting in evil deeds, persisting in evil words, persisting in evil thoughts, speaking ill of the noble, holding lying opinions, are incurring the fruit of lying opinions. They, separated from the body after death, have fallen into misery, suffering, retribution, punishment. But, on the other hand, these personages, persisting in good deeds, persisting in good words, persisting in good thoughts, speaking well of the noble, holding true views, are enjoying the fruit of true views. They, separated from the body after death, have entered into a realm of happy manifestation.’ Thus, with divine vision, pure, surpassing that of the sons of men, he sees beings departing and coming into manifestation, debased or excellent, fair or foul, righteous or evil; he sees these beings faring according to their works. “Of a truth, Banyan, a transgression overtook you today. But as you acknowledge your transgression honestly, we accept your confession. For this is the rule of the noble one, that he who, overtaken by a transgression, acknowledges and confesses it, making amends, thereby gains the mastery over that fault.